A lot of us have music or particular songs that we relate to various points in our lives. We have break-up songs to cry to and angry songs for when we’re mad. We remember the song that we first slow-danced to and what was playing at some critical moment in our lives. And, sometimes, if we’re lucky, there’s a singer or band that we love all our lives. For me, there’s two: James Taylor and even more, Linda Ronstadt. I first saw Linda Ronstadt at a concert in the early 1970s. It was my first rock concert, tickets cost about $6. I thought at the time that Linda was actually the warm-up act for the Eagles. I’ve since learned that she was actually instrumental in bringing them together, hiring them as studio musicians. When it was her time to sing, she came out on stage dressed in what can only be described as a caftan (like many of us, she has fought the weight battle). So this woman walks up to the mike and begins to sing. I had heard her on the radio before. Different Drum has always been my favorite song. But her voice was so pure and her presence so powerful that I was riveted. I don’t remember much about the Eagles’ performance (I’m sure they were good) but I left the show a definite Ronstadt fan. This Ronstadt fan within a few years packed up and headed to college with all my albums in tow. Heart like a Wheel was recently released and became the theme song of all the dramatic souls on Second East. Oh, how we sang out about faithless love on our “hall of broken dreams”. You’re No Good and Willin suited us all at some point as we were wooed by the fraternity boys. Linda’s weight problem seemed handled by the end of the 1970s. Looking slim, pretty and downright athletic on the cover, she released her Living in the USA album. Some of my favorite songs off that album were a bit melancholy (Alison) and some were wonderful remakes (Love Me Tender). This was the disco period and I definitely admire that she never released an album reflecting the popular genre. 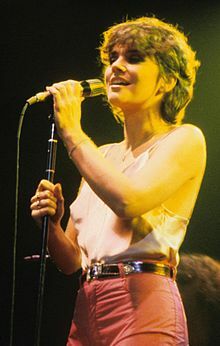 It was after I was out of college when an opportunity arose to see Linda Ronstadt in person, at an arena in the Washington, DC metro area. She sang so many of the songs I’d grown along with. Even more special were my companions – my college roommate (who has since passed away) and the (then) current man in my life. Shortly after this concert, Linda released another album, Get Closer, It came out about the time I was marrying and having my first child so this is what my daughter learned to be danced around to; well, this and the other albums of hers that I had. But the next two albums weren’t purchased as I followed life’s currents. For most of the late ’80’s, my top artist was Cookie Monster, singing C is For Cookies. Technology took a turn at this point. Record albums were replaced by cassette tapes. Then cassette tapes were replaced by CDs. Now CDs have been replaced by digital files. Who knows what will come next. While my record albums still play for me, I’ve lost my cassette tapes of Winter Light and Feels Like Home. Around this time, Linda recorded a duet with Aaron Neville, Don’t Know Much. Their voices blended beautifully; it was a song I really enjoyed hearing. After that, I think Linda decided she’d played this game long enough. She picked new directions to take for a couple of her albums. After a long, successful career she was entitled. She released an album of standards (think Rat Pack period music) on For Sentimental Reasons and then one with an Hispanic tilt in honor of her father entitled appropriately Cancione de mi Padre. Yesterday, I heard that LInda Ronstadt has Parkinson’s Disease and can no longer sing. My heart breaks for her and for her lost talent (she says she can no longer sing). I realize that she won’t read this post but I need to send out good wishes and prayers as she joins the esteemed assembly who are similarly afflicted. No one who has it is happy to see someone else join. Linda, thanks for all the years of sharing your talent with us. Categories: Favorites, Linda Ronstadt, Things I Like | Tags: Favorites | Permalink.